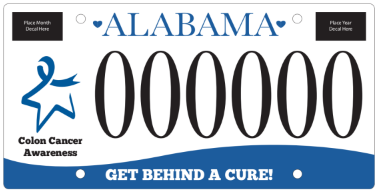 Rumpshaker, Inc. is pleased to announce the first Alabama car tag to raise awareness about colon cancer. Thank you for your support! We successfully obtained 261 pre-commitments and are working with the Alabama Department of Revenue Motor Vehicle Division to get the license plate production. If you purchased a pre-commitment, you will receive a notification email from the Alabama Department of Revenue office once the new plate is available. This email will be sent to the address you provide at the time of your pre-commitment purchase and will contain a receipt and a Commitment to Purchase Voucher for the colon cancer car tag. You will present this to the licensing official's office for redemption of your specialty plate. If you have any questions please call or email Jacky Turner (256-346-5014 / jacky.turner@rumpshaker5k.com). Rumpshaker, Inc. is the non-profit organization behind the Rumpshaker 5K and 1 Mile Fun Run. Our founders, board of directors and race committee all agree that raising awareness about colon cancer matters. It matters because colon cancer has the potential to affect all of us. It is equally common in men and women, it can develop without any symptoms, and it can develop at any age. By increasing awareness about this disease we hope to increase the screening rates. Colon cancer is one of the most treatable and beatable cancers if diagnosed early, sadly many individuals delay their routine colonoscopies and their cancer is found in a later stage when treatment options and success rates are minimized. Our organization was created in memory of Lisa Martz. Lisa was diagnosed with colon cancer at the age of 48, the only symptom she had was fatigue. Lisa was not the type of person who liked bringing attention to herself but during her nearly 4 year fight with this disease she was the true symbol of hope, faith and determination. Those around her took notice of her extraordinarily positive attitude and strength despite her circumstances. Be sure and check out this great article from WBRC Fox 6 News Chief Meteorologist J-P Dice on his recent experience with new technology to help catch Colorectal Cancer. The Lisa Martz Hope Scholarships will be awarded to deserving students whether they are entering college for the first time or are already established students. These scholarships are to assist students whose families have been impacted by colorectal cancer.